On twitter I asked what you guys wanted me to write about so @luv2tan97 this one is for you! She asked, “ How bout something geared towards us “older” ladies. Skincare, hair, clothes ideas.” I was on the phone with my mom when I read this and my Mom said “Yes, put some outfits together that I would wear not you!” Ok ok point taken mom you don’t want to wear sequined leggings. So @luv2tan97 and mom this is for you! 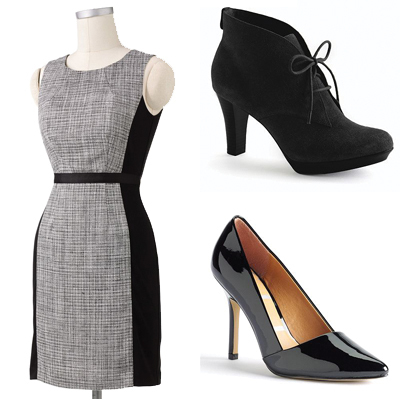 Holiday parties are right around the corner and you need to look snazzy! Here are a few great outfits! The middle of the dress is a subtle pattern where the sides are a solid black which creates the perfect figure-flattering dress. Or if you just like a heel these are fantastic also from Kohl’s (Link to Purchase). Throw on a statement cuff in silver and some dangly earrings for the perfect look! 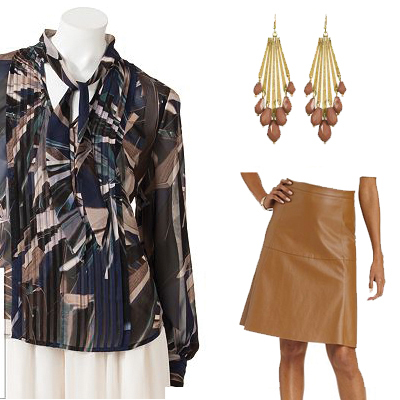 This next look is very versatile and oh so fall! This silver-toned dress from Kohl’s for $70 will certainly turn heads with its great cut and gorgeous shimmer. I love the flattering neckline and the gorgeous ruffle side detail. This dress would look hot with a great pair or black pumps such as these (Link to Purchase) which are awesome because the beautiful brooch compliments the dress well. This bangle set from Kohl’s by JLo (Link to Purchase) and these stunning twist earrings (Link to Purchase) will really make heads turn at whatever party you are attending!